'I Lost A Hand And This Is Workman's Comp. ... I Didn't Lose A Hook!' Dennis Whedbee's experience illustrates the trade-offs for injured workers as states and insurance carriers seek to trim workers' comp by gaining more control over treatment decisions. Dennis Whedbee, of Homer City, Pa., lost half of his left arm in a drilling accident in North Dakota in September 2012. The tattoos on Dennis Whedbee's left arm describe what he lost when the North Dakota oil rig where he was working blew out in 2012. There's an image of a severed hand spurting blood, framed by the word "LOST" in block letters and the date: "9-23-12." This investigation was created in partnership between NPR News Investigation's Howard Berkes and Michael Grabell of ProPublica, an investigative journalism organization. The message underscores Whedbee's frustration with a workers' compensation system in which benefits and access to benefits have changed in North Dakota and across the country. 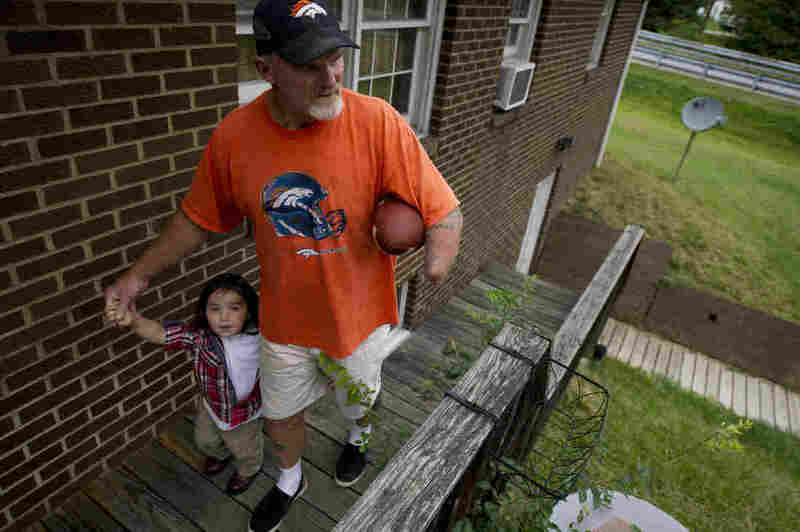 "I lost a hand at work and this is workman's comp," Whedbee, 53, says at his home in Pennsylvania. "Give me what I deserve. I deserve a hand." Whedbee's orthopedic surgeon said he was a perfect candidate for a high-tech myoelectric arm and hand, which are routinely provided to workplace amputees in other states. The $70,000 device mirrors the look and function of a human limb. But the workers' compensation system in North Dakota instead opted for a mechanical arm with a hook, which costs $50,000 less. "I lost a hand working in North Dakota," Whedbee says. "I didn't lose a hook!" Whedbee's story is the latest piece in an ongoing investigation by NPR and ProPublica that shows how states have slashed workers' compensation benefits in recent years. In the past decade, lawmakers in 33 states have cut workers' comp benefit payments, made it tougher to qualify for benefits or made it more difficult to receive medical care. * How Much Is A Limb Worth? For more on this investigation, NPR and ProPublica reporters participated in a Reddit Ask Me Anything. Follow along with the full series on NPR and ProPublica.